Mid-Western Car Carriers is proud to be family-owned and operated since 1976. We pride ourselves on operating our business like a family. Our dedicated staff works hard and is rewarded with competitive pay, a fair work environment and opportunities for advancement. We fully believe there is nothing more important than protecting our people, the environment and everyone who travels on our nation’s highways. Therefore, safety is of the utmost importance and will take precedence over everything we do. Our mission is to provide dependable, efficient, cost effective, professional auto transportation services to our customers. We will safely deliver our customers cargo while meeting or exceeding expectations in safety, quality and on-time performance. We are a family orientated company that understands our success depends upon the contributions of all of our employees and our goal is to treat all of our workforce with the respect. We will also provide a safe and pleasant work environment for everyone while encouraging professional development and teamwork throughout our organization. In accordance with our mission statement, Mid-Western Car Carriers also believes in our DRIVE program. We feel that through our DRIVE program we will have a competitive advantage and continue to grow and be successful now and well into the future. Servicing our customers’ needs by delivering their products damage free and on time. Investing in resources such as people, technology, tools and equipment to create a competitive advantage. Continued education of our employees on industry best practices and sharing that information both internally and with our customers. Maintaining a vision for the growth of our company that continues to make us leaders in the industry. Promoting honesty, fairness, responsibility, and principles throughout our business that help us gain a distinct advantage over our competitors through the creation of partnerships with our customers. If you want to apply using our paper form, please download the MWCCI Employment Application in PDF format. 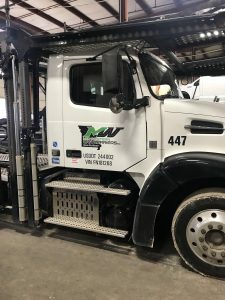 Founded in 1976, Mid-Western Car Carriers operates over 60 auto transport trucks delivering used and new vehicles with nationwide service and a fleet maintenance facility in Kansas City, Missouri.